South Gallia sophomore Faith Poling (23) hits a spike attempt over a Southern blocker during Game 1 of Tuesday night’s TVC Hocking volleyball match in Mercerville, Ohio. Southern junior Sydney Adams (16) tips a ball over the outstretched arms of a South Gallia blocker during Game 2 of Tuesday night’s TVC Hocking volleyball match in Mercerville, Ohio. MERCERVILLE, Ohio — The difference was in the depth. 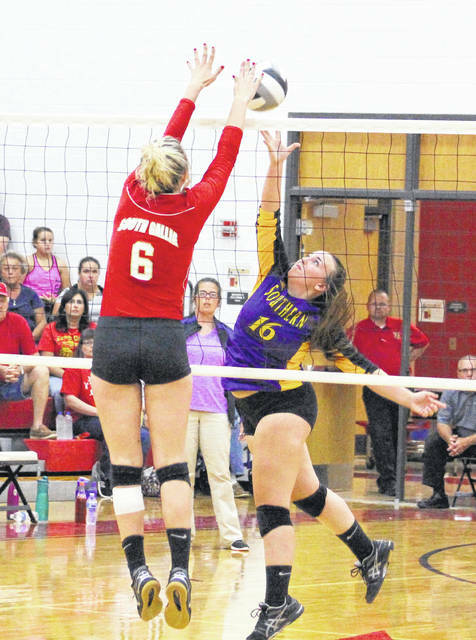 The South Gallia volleyball team notched its third straight victory on Tuesday night with a 25-18, 13-25, 25-23, 25-20 decision over visiting Southern in a Tri-Valley Conference Hocking Division match in Gallia County. 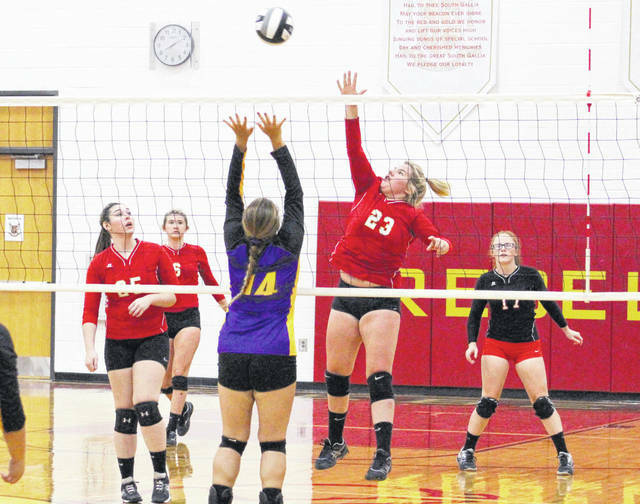 The host Lady Rebels (4-5, 2-2 TVC Hocking) used a collective effort — particularly at the net — to help wear down the Lady Tornadoes (0-8, 0-5) over the course of four games. Overall, the Red and Gold produced only two more points in the contest than Southern, and both squads combined for 13 ties and 12 lead changes over the course of the night. The Purple and Gold took its only lead in Game 1 at 8-7, but the Lady Rebels answered with four straight points while building an 11-7 cushion. South Gallia went on a 14-10 run — including taking its largest lead at 21-13 — to wrap up the seven-point decision for a 1-0 match advantage. Both teams traded leads in Game 2, but the Lady Tornadoes broke away from a two-all tie with five consecutive points before taking their first double-digit lead at 18-8. The guests won seven of the final dozen points and knotted the match at one with the 12-point triumph. Game 3 proved to be the difference-maker as the two programs battled through seven ties and five lead changes, with neither squad leading by more than four points. Tied at 19-all, South Gallia scored five of the next six points while securing a 24-20 edge. Southern rallied back to within 24-23, but the hosts finally broke serve and wrapped up the minimal two-point win for a 2-1 match lead. The Lady Rebels never trailed in Game 4 and twice led by as many as six points, the last of which came at 22-16. The guests closed to within four points on three different occasions, but ultimately fell by five points to wrap up the 3-1 outcome. Afterwards, SGHS coach Sarah Shirley was proud of the way her troops rallied together as the night progressed. Then again, there’s been a lot of that going on of late for the Lady Rebels. Conversely, SHS coach Kim Hupp was pleased with the overall effort of her team … but the third-year mentor also felt that the loss was more of a mental setback than anything else. That’s the one area that Hupp wants to see improvement in as the year progresses — because she believes it will make a difference. Rachal Colburn led the South Gallia service attack with 19 points, followed by Christine Griffith with seven points and Isabella Cochran with six points. Faith Poling was next with four points, while Amaya Howell and Emma Shamblin each contributed three points. Makayla Waugh also had two service points for the victors. Griffith led the net attack with 10 kills and a dozen blocks, with Colburn adding seven kills and eight blocks. Poling had two kills, while Howell and Katie Bowling also had a kill apiece. Baylee Grueser led the SHS service attack with 13 points, followed by Sydney Adams with 11 points. Marissa Booker and Baylee Wolfe were next with six points each, while Kassie Barton and Phoenix Cleland respectively chipped in four and three points. 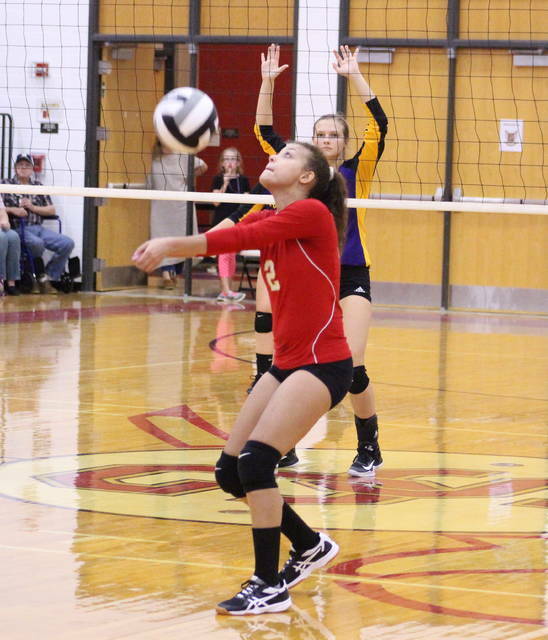 Wolfe led the Lady Tornadoes with 12 kills, followed by Saelym Larsen with four kills and Cleland with three kills. Booker and Mickenzie Ferrell also had a kill apiece. Cleland guided Southern with five blocks and Wolfe added another three blocks. Both programs return to TVC Hocking action Thursday as South Gallia heads to Eastern and Southern hosts Trimble. Both matches will start at approximately 7 p.m.